That would sound pretty good, right? Years ago, I stopped doing all the long slow cardio nonsense and as soon as I did, I was finally able to transform my body. And truth be told, even though I stopped traditional cardio, I was still in the best cardio shape of my life. Not only that, but I was burning more fat than ever before and was adding and preserving hard earned lean muscle. In a recent study, researchers found that the combination of diet and traditional cardio caused participants to lose up to 22% of their lean muscle. In comparison, participants who combined diet and resistance training saw 97% fat loss and only 3% lean muscle loss. What this tells us is that when we do the proper exercises, we not only burn more fat but we can also easily maintain and add lean muscle. I have shared this before, but look at a sprinter compared to a marathon runner. A sprinter, who engages in lots of resistance training and proper cardio workouts, is easily able to burn fat and keep their lean muscle. Marathon runners and traditional cardio users on the other hand, burn a ton of lean muscle during their workouts making it nearly impossible to get the physique they want. Now here’s the good news… As I said earlier, you can still do cardio and be in great cardio shape IF you do the right exercises and workouts. I stayed in tip-top basketball shape throughout my college playing career while never doing an ounce of “cardio”. Here is the key: Focus on short, intense bursts… then rest and repeat. Research shows us that these kinds of workouts are what allow the body to burn fat more easily and manipulate important hormones. 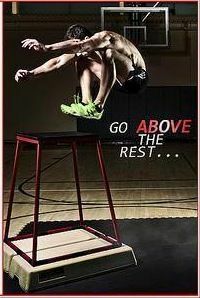 See, high intensity workouts and exercises cause a rise in both Growth Hormone (GH) and testosterone. Both of these hormones play a key role in keeping us strong, lean, and healthy. What these workouts also do is keep cortisol levels LOW. Cortisol is a fat storing hormone, something that is present during long bouts of cardio and exercise. When doing short, intense bursts of exercise, not only are you allowing your body to produce GH and testosterone, you are also keeping cortisol to a minimum! Listen, I love doing cardio… I mean I did create Superhero Sprints and all. Yet realize that when it comes to cardio there is a better way to go than the traditional jogs on the treadmill or long rides on the elliptical. ==> Learn the method that allowed Mike to lose 105 pounds while doing ZERO cardio! The best and easiest way to get your cardio done while replacing traditional long cardio is by adding in a short finisher at the end of your resistance training workout. That is really all there is to it… Properly placing high intensity exercises into a short 4-8 minute circuit so you can start doubling your fat burn at the end of your workout. Now heres the good news… Today you can grab a full 51 follow-along finisher workouts PLUS 21-minute metabolic blaster workouts PLUS a free copy of my Superhero Supersets and Superhero Supercharged programs all for just $27. <—-Plug into any resistance training workout! 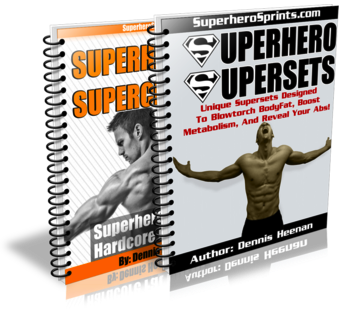 And remember, simply email your receipt to dennis (at) fatburningnation (dot) com get full access to my two newest programs: Superhero Supersets and Superhero Supercharged! These two programs alone go for $37 each and they are your’s FREE! Get all 51 finishers today and start burning more fat at the end of your workouts than ever before. ==> 51 Metabolic Shocking Finisher Workouts <—- Plug into any workout program!